In approaching this problem, others have approached it with the aim of learning best practices that applied to model careers as a transgender fashion model. The best way to evaluate the issues to move towards an understanding was to research those who have written on the subject. I wanted to find articles with a Transgender model’s personal experience to site the lack of inclusion first hand. The goal was to see if this observation was shared by Transgender models in the fashion industry to gain perspective on the topic. The articles found by my research stemmed from resources such as The New York Times article “Transgender Model Finds a Home” (Krueger, 2017) and Refinery 29’s article “How Did an Entire Group of People Become a Fashion Trend?” (Siemens, 2017). These articles reassured investigators that the problem of the fashion world lacks the inclusion of transgender models and this was a discussion within the industry. Reading that the dialogue of this problem has begun in periodicals and internet magazines gave a foundation for my research. I discovered that a lack of inclusivity of Transgender models was relevant and the solution to this unique problem was one that both Transgender models and the fashion industry wanted to solve. The next level of research reflected was the book in print on the fashion industry with proposed solutions and best practices to be implemented into the Transgender model’s career. Books on modeling careers such as “Your Modeling Career” by Debbie Press (Press, 2004) to lay down the framework of the modeling career process. These books gave me a baseline for what is seen as a normal career path within the fashion modeling profession. Biographies on transgender models such as the book “Transgender Anjali Lama: The World’s First Transgender Runway Supermodel” (Wolstencroft, 2016) helped analyze how Transgender models can become successful in a gender orientated profession. 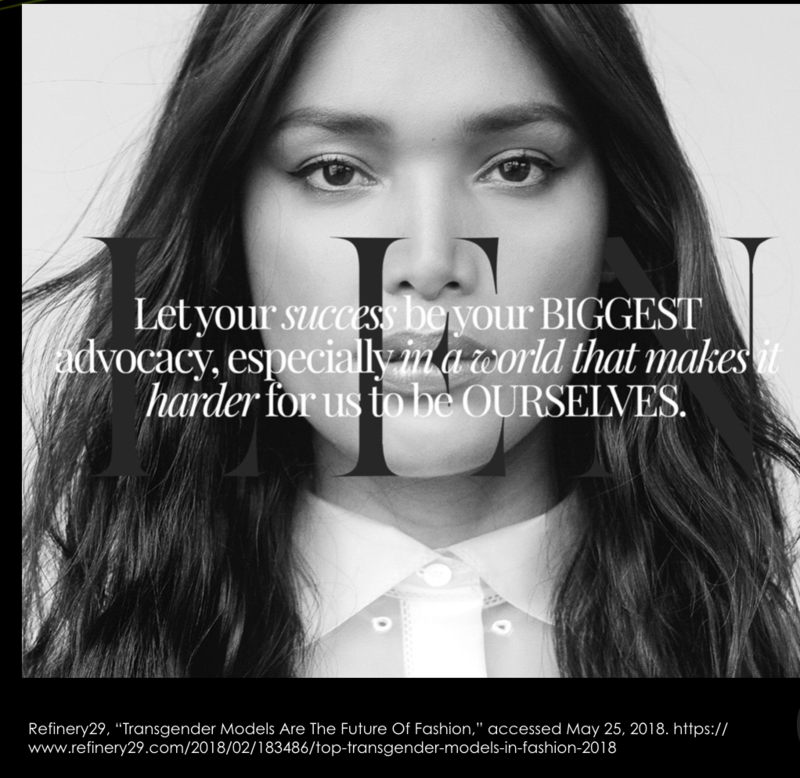 All of these publications pointed to using new media marketing as a way to build presence and activism within the fashion community to show the need for expanding the world of fashion models to include members of the transgender community. With this solution in mind, I expanded to published books on the fundamentals of new media. The title I use the most frequent for this part of my research was “The Fundamentals of Digital Fashion Marketing” by Clare Harris and Social Media for Fashion Marketing: Storytelling in a Digital World by Wendy K. Bendoni. The books have served as textbooks used in academic on practice and theories on new media and social media marketing. The academic world has also published printed material to peer-reviewed articles on the subject of Transgender models in the fashion industry. These articles were accessed from The Denver University Library using the Compass, an academic resource tool used by The University of Denver masters and doctoral students. The Sage Publication peer-reviewed article “Gender on Display: Performativity in Fashion Modeling” (Entwistle and Mears, 2012) served as an anchor for academic integrity. 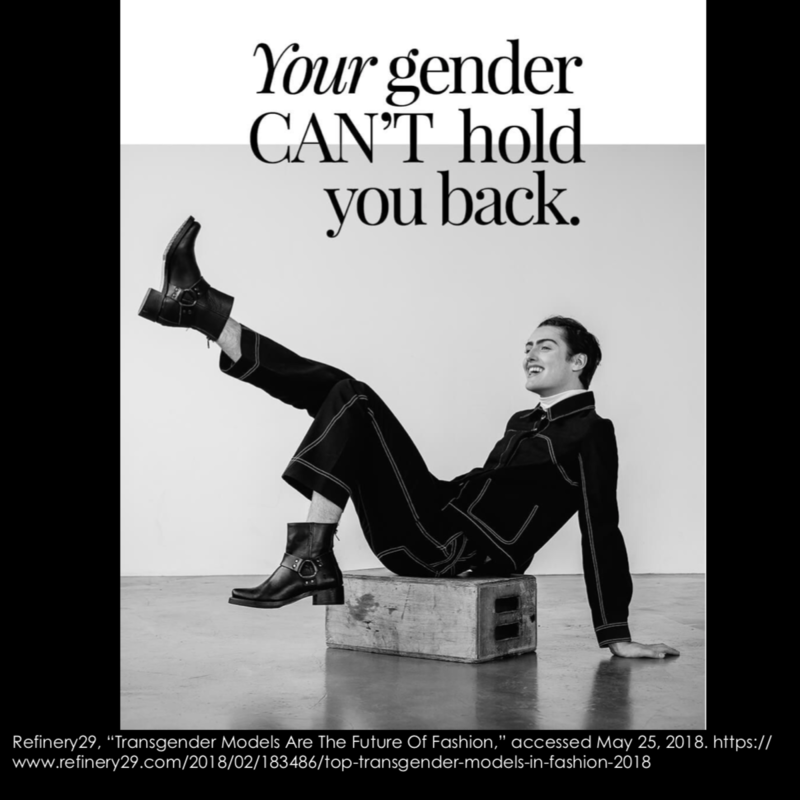 This article approached the same topic regarding questioning gender normative culture and how this can hinder the presence of transgender fashion models into the industry. For a first-hand account of a transgender fashion model the University Wire article “Fashion Industry Still Lack Inclusivity, Transgender Model Says” (Carlsbad, 2018) reiterated that this problem was still in exitance as of March of 2018.